Died: 23rd October 1918; age 31; Died of Wounds. Employed: by Mr. Curtis, a Corn Merchant. 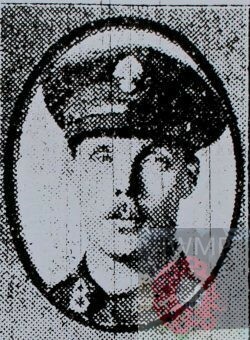 Wounded and sent home – 22nd October 1917; returned to France 30th September 1917. Regiment: Royal Fusiliers, London Regiment, 11th Battalion. Relatives Notified & Address: Son of Mr H. Carter, of 44, Albion Street, Ipswich. 1891 30, White Elm Street, Ipswich. Ernest was 3 years old and living with his parents, siblings & widowed, maternal grandfather. Henry Benjamin Carter, 39, a Quay Porter, born Ipswich. Caroline Georgina Carter (nee Price), 32, born Portsmouth, Hampshire. Henry John Carter, 13, born Ipswich. Frederick William Carter, 9, born Ipswich. Caroline Matilda Carter, 6, born Ipswich. John Price, 70, born Liverpool, Lancashire. 1901 30, White Elm Street, Ipswich. Ernest was 14 years old and living with his parents & siblings. Henry, 50, a Quay Porter. Henry, 23, a Coal Porter. Frederick, 19, a Coal Porter. Amelia Alice Carter, 9, born Ipswich. Ruth Elizabeth Carter, 7, born Ipswich. Louisa Ada Carter, 3 months, born Ipswich. 1911 3, Duke Street, Ipswich. Ernest was 23 years old, a Quay Labourer. He was living with his parents & siblings. Henry, 58, a Quay Labourer. Fred, 28, a Quay Labourer. Ruth, 16, worker at a Sack Factory. Soldiers’ Effects to Caroline G. Carter – mother. Ernest is also remembered on Holy Trinity Church Memorial Ipswich.